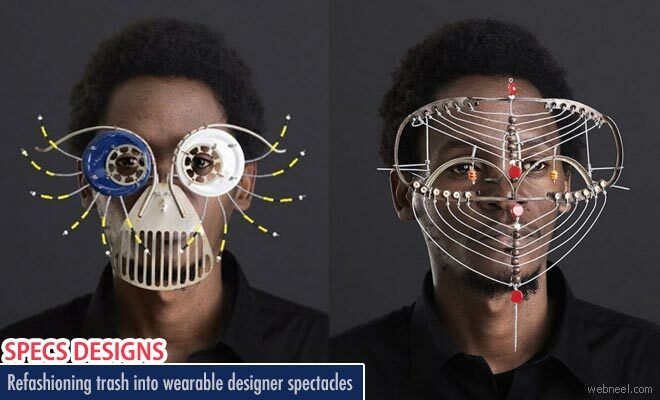 Designer Spectacles : The used electronic waste and other trashes are the raw materials for the young Kenyan scultor Cyrus Kabiru, who refashions them into wearable glasses. These are obsolutely his own creations which certainly has unique and attrative features. Kabiru is a confident and individualistic self-taught artist whose passion for wearing glasses which is actually denied by his father during his childhood is the inspiration. His designer spectacles situate themselves in several different areas of art, shuffling between performance, sculpture, and fashion—embodying the playfulness of the youth generation in Nairobi. In addition to his glasses and object sculptures, cyrus is a self-taught painter, subject being the contemporary kenyan life in a humorous way.